The astrogeographical coordinates of a country`s geographical center can provide data that explain central topics of resonance of the surface field of the land itself. The position may even be assumed to function as the heart of the morphogenetic surface field of a country`s territory. The introduction of this method is another breakthrough in mundane astrology and it clearly shows how much importance and exact resonance can be taken from a precise study of astrogeographical data. 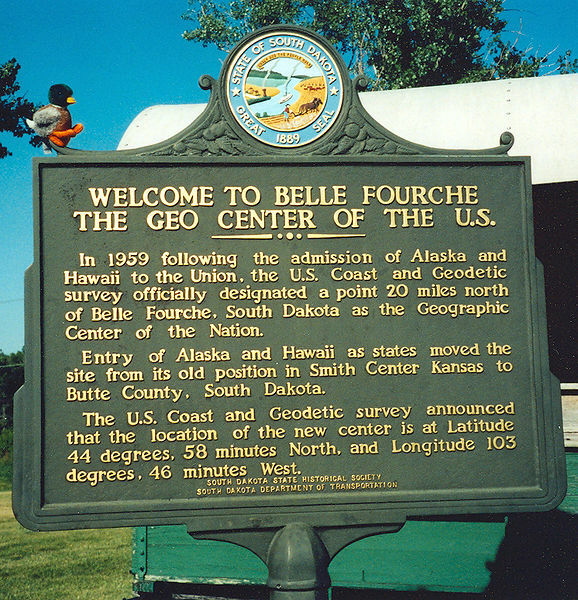 In the case of the USA the geographical centee lies in Belle Fourche, South Dakota. It has been regarded as such by the U.S. National Geodetic Survey (NGS) since the additions of Alaska and Hawaii to the United States in 1959. The site here has been regarded as such by the U.S. National Geodetic Survey (NGS) since the additions of Alaska and Hawaii to the United States in 1959. Astrogeographical position for morphogenetic field level 1 (supraregional resonance) which provides a central resonating degree for the surface fielkd of the US territory and the land itself: The astrogeographical coordinates for the suprarageional field level 1 are located in 14° in fire sign Leo and 8° in fire sign Aries. Astrogeographical position for morphogenetic field level 4 (exact adress) which describes the atmosphere of the national monument itself: The exact position of the National monument is located in the 2 Venus signs Libra and Taurus. Air sign Libra as the sign of the midpoint of the zodiac and of the balance of its two halves is relates to the topic of measuring out the exact balance at the midpoint between tthe 4 directions. Earth sign Taurus the sign of the earth and main indicator for the land itself stands for the ground and land itself.